After planning had taken place for many months, ships from Bahrain, Kuwait, Saudi Arabia, UAE, and the US conducted Exercise Goalkeeper 11-01 in the Central and Southern Arabian Gulf to train across the spectrum of Maritime Security Operations (MSO). 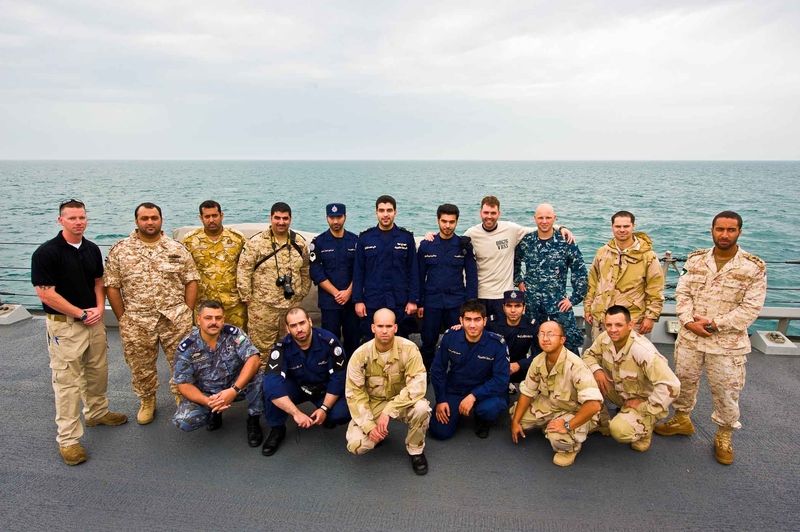 Two observers from the Kuwait Navy, two from the Royal Bahrain Navy (CTF 152 staff), one from the Qatari Emiri Navy, two from the United Arab Emirates Coast Guard, and two from the Jordanian Navy were all present aboard USS HIGGINS for the entirety of the exercise. Led by Colonel Isa Al Doseri, commander, Combined Task Force (CTF) 152, the Arabian Gulf maritime security and cooperation mission of Combined Maritime Forces (CMF), the seven day exercise focused on coordinating coalition MSO at sea, as well as improving the dissemination of information among regional command centers and building relationships between contributing nations. Goalkeeper 11-01 provided participants with a focused opportunity to exercise their abilities to locate and track various vessels, practice boarding techniques and share tactics, procedures and best practices among regional experts. 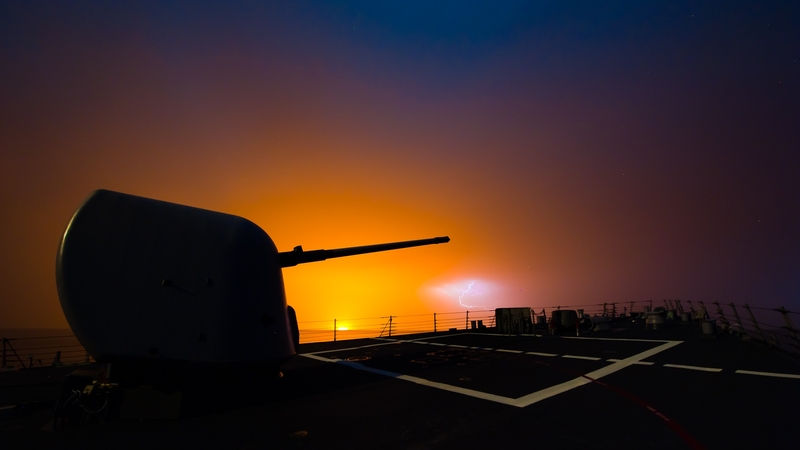 Goalkeeper was designed to validate the core Command and Control capabilities of the CTF 152 MSO mission and refine the processes that ensure rapid information flow between command centers and the task force. Colonel Al Doseri explained that the exercise’s key focus was working as a synchronized coalition team at sea and on shore to meet the challenge of locating and tracking specific vessels deemed to pose a threat of any kind to maritime security or to coalition nations in the Gulf region. During the evolution, a simulated contact of interest (COI) transited the length of the Arabian Gulf while being detected by sea, air and ground based sensors, and continuously monitored and evaluated by coalition forces. Once detected, COI positional information and status was shared “real time” between regional Naval Operational Centres, that in turn tasked their naval and coastguard units and boarding teams to intercept the simulated contact. Participating forces rendezvoused at sea with the vessel, where upon they conducted realistic boarding scenarios of various levels of complexity. 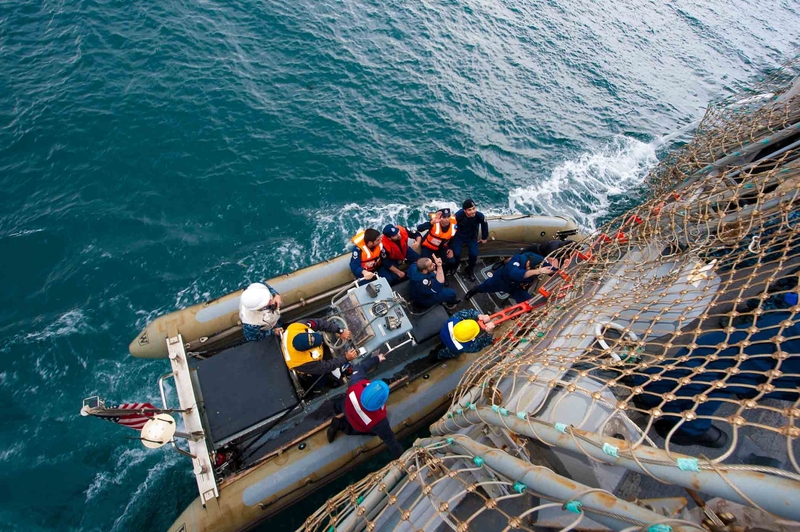 These interactions at sea served to hone skills and refine tactics, techniques, and procedures in support of Visit, Board, Search, and Seizure (VBSS); a critical enabling capability to support MSO. CTF 152, the Arabian Gulf security and cooperation task force within CMF, conducts MSO in conjunction with regional partners to promote legitimate use of the sea and maritime security for the benefit of all. Activities conducted by the task force include counter terrorism, maritime infrastructure protection and regional engagement of maritime partners. CTF 152 is currently led by the Royal Bahrain Naval Force. It is one of three task forces that reports to Commander, Combined Maritime Forces, Vice Admiral Mark Fox. 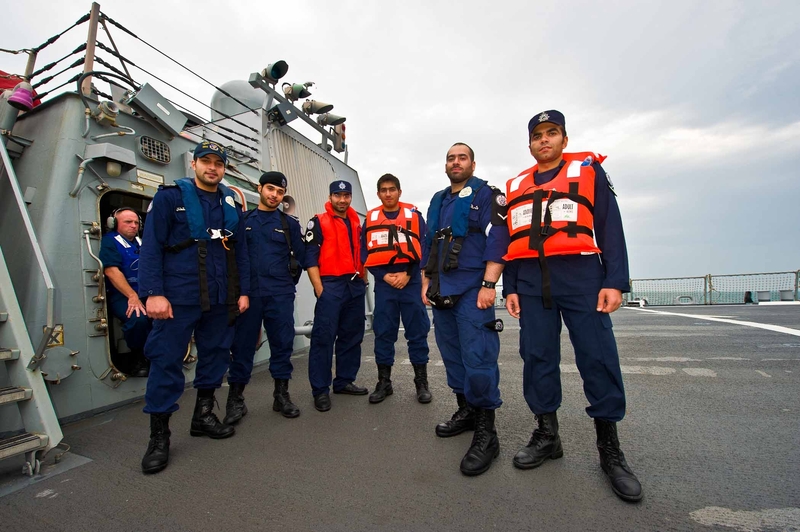 CMF is a multi-national naval partnership, which exists to promote security, stability and prosperity across approximately 2.5 million square miles of international waters in the Middle East, which encompass some of the world’s most important shipping lanes. CMF’s main focus areas are defeating terrorism, preventing piracy, encouraging regional cooperation, and promoting a safe maritime environment.